When I got the idea to go to a farmers market today it was already too late. They were closed. So I went to Vons instead. I bought bananas, a big yam, an avocado, a butternut squash, a fennel bulb, carrots and Jonagold Apples to try and make more baby food. 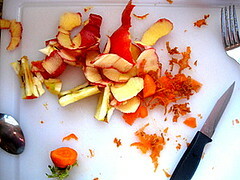 Everything is done except the yam, meaning, everything got pureed but the yam. It's cooked and waiting for me but I'm too tired now! I needed to make a lot today because of how fast my supply is dwindling. It turns out bananas and avocados are soft enough raw that you do not need to cook them at all to mash them. I made a banana-cado mash with a fork. It looked like a lot even though I only used about 1/5 of the avocado and 1/4 of a large banana. Maxine loved it! I tasted it, too, just to make sure why she liked it. 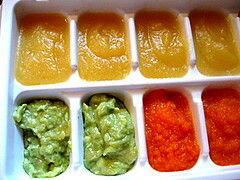 She ate so much of it that I could only fill two wells in the ice cube tray with this mixture. Yes, it will probably brown a little but the flavor will still be there so I'm okay with that. I found a site I like and that I referred to today specifically for the banana-cado recipe. The site is called weelicious. The layout is simple and the recipes look great. The squash was a big one, I guess. I got SO much food out of it! 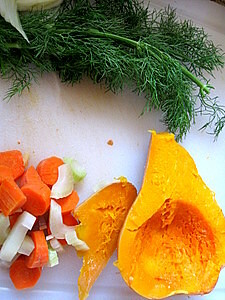 I did one puree of plain butternut squash, one with carrots, fennel and squash and one with banana and squash. The colors are so pretty. Maxine didn't care for the plain batch, which is why I started mixing it with other stuff. She liked the mixed batches. She was my little taste tester but I tasted it all, too. 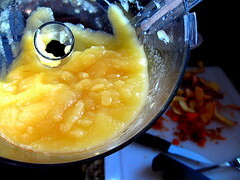 I also made apple sauce good enough to serve for dinner... to adults! All I did was add a bit of cinnamon. It came out so good. I'm positive Maxine enjoys eating my baby food. She eats so much more now than before. It's quite surprising how pushy she gets when I feed her! She wants me to hurry up with the next spoonful and there is still food in her mouth. I'm pretty flattered. Something interesting about fennel: it can relieve your baby's gassiness, it aides in digestion and can calm down a teething baby. thats pretty cool and probably saves you money huh? i don't really know what fennel is or looks like, but i think i dont like it; i know i dont like fennel seeds in italian dishes. but i do like butternut squash. My friend lina cooks it with coconut milk and bacon and it's pretty good. Actually, fennel tastes MUCH different than fennel seeds, which I don't like either. If I am eating a sausage pizza and I see one, I take it off. Fresh fennel tastes a little like citrussy licorice. I'm learning from you. I think Maxine is going to be another smart cookie (like Raquel) because you feed her such brain healthy food!